The legendary Bennett's Curse is back in 2018 with our most terrifying show to date! 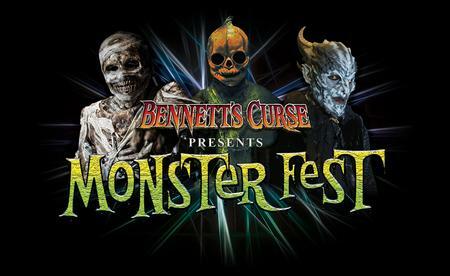 We are proud to introduce Bennett's Curse MONSTER FEST! With an even greater focus on fear, you will NOT find a SCARIER haunted house anywhere around. From asylum patients to classic monsters and everything in between MONSTER FEST will offer everything you've come to expect from Maryland/DC's #1 Halloween Attraction, and a whole lot more!! We've taken our best scares and best scenes along with our scariest monsters while adding many amazing new surprises all combining to unleash pure terror on all those brave enough to visit. Visit us at our all new location at 7875A Eastpoint Mall in Baltimore County, MD next to Gabe's for an amazing value to enter one of America's best Haunts! Southern Maryland's Biggest haunted attraction is back for another horrific Halloween season with over 20 acres of farm fields waiting to terrorize you and your friends! Come down and check out the Grinner Family's Cannibal Creek Haunted Trail, and pray you can survive without becoming their next meal. Take a ride through Zombie infested farm fields with our paintball guns and see if you can survive this years Z-Pocalypse Paintball Hayride. And finally take a stroll through the newest attraction, Twisty's Twisted Corn Maze with our Flashlights, and pray the batteries don't go DEAD on you! Plus while you wait, check out our Midway of Madness! More than just trails of terror, our Twisted Fields will be loaded with activities while you wait. Play games, get your pictures taken with actors and enjoy some local food from several local food vendors. Located in Lancaster, Pennsylvania.Field of Screams offers a World Class Haunted Hayride, a Terrifying Haunted Den of Darkness Horror Barn, and more. Click this profile for information, directions, photos, videos and more.